The historic last concert ever filmed of The Doors is now available for the first time. Eagle Rock Entertainment proudly presents The Doors: Live At The Isle Of Wight 1970 on DVD/CD, Blu-ray/CD and digital video on February 23rd. The last known unseen performance of The Doors in existence, The Doors: Live At The Isle Of Wight 1970 has been completely recut and remixed, from the original film footage. Fully approved by The Doors, this previously unreleased concert was meticulously restored via the latest 21st century technology, color correcting and visually upgrading the original footage. The entire concert, which is now presented in 5.1 Dolby Digital sound, was mixed from the original multi-track audio by longtime Doors engineer/mixer/co-producer Bruce Botnick. 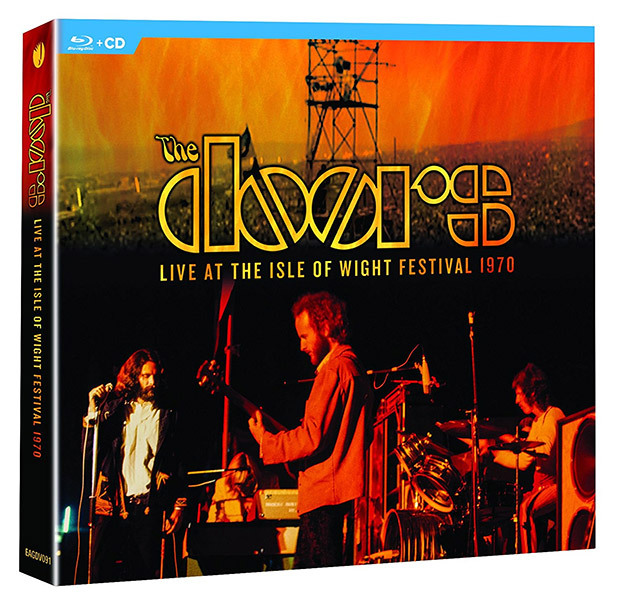 Fans may have caught a glimpse of this performance in the 1997 Isle of Wight film Message To Love, however this package presents The Doors’ set with the full-length songs in maximum visual and sound quality. The Doors: Live At The Isle Of Wight 1970 captures and showcases the essence of this poignant performance, as well as offering a snapshot of the era, with footage of more than 600,000 fans in attendance tearing down barriers and crashing the gates to gain access to the event. The Doors hit the stage at 2 am on August 30, 1970, delivering a set that further proved the musical power that marked them as a beacon of the Summer of Love. In this 84-minute DVD, Morrison, organist Ray Manzarek, guitarist Robby Krieger, and drummer John Densmore traverse such staples as “Roadhouse Blues”, “Break On Through (To The Other Side)”, and “Light My Fire”. Illuminated by a mere red spotlight (the band weren’t informed that they needed to bring their own lighting equipment) gave the show an eerie crimson hue, almost echoing the figurative weight of the trial.